Planted between Ted and a normal boyhood was Ben Solotaroff, as hard a father to placate, defy, and finally accept as can be found in the annals of the American memoir. Tough, bullying, seductive, Ben Solotaroff was a self-made man—"almost all ego and almost no conscience"—who made a success of his glass business and a wasteland of his home life. 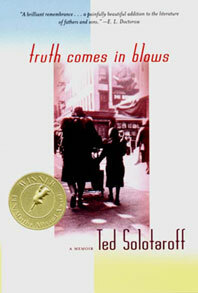 Against a crystalline view of American life in the 1930s and '40s, Truth Comes in Blows places its classic themes—the ambivalent love of a son for his victimized mother, the romance of post-immigrant Jews with middle America, sports and masculinity, the guilty imperatives of breaking away—and renews them with a candor Philip Roth praised as "not only a literary achievement but a considerable moral achievement as well." A reading group guide is bound into the paperback.